Before turning to the high frequency weekly indicators, as usual let's briefly check out the monthly reports. Virtually all of the monthly data reported this week was positive, including industrial production, capacity utilization, the Empire State and Philly Fed reports, and housing permits and existing home sales. On the other hand, housing starts did decline month over month, and consumer prices were totally flat, meaning that in 4Q 2011 there was a very slight DEflation, normally a sign of coincident weakness. There is still one more week where holiday seasonality can significantly influence the some of high frequency weekly indicators. 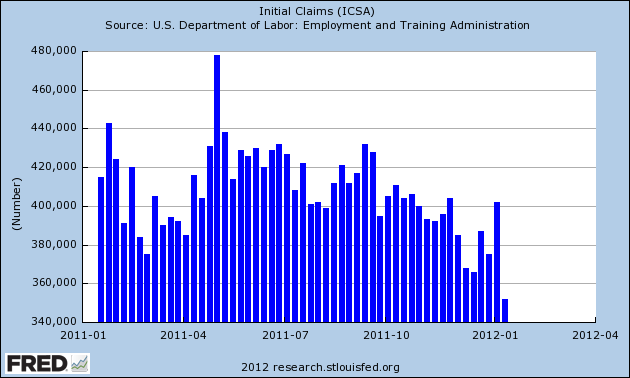 The BLS reported that Initial jobless claims fell by 47,000 to 352,000, the best report in almost 4 years. The four week average declined by 3500 to 379,000. This is close to the lowest level since mid-2008. The American Staffing Association Index rose by 11 to 84 last week, the best January reading since 2008. The steep rise nevertheless does show typical seasonality. There was a surge in tax withholding in the last 20 day reporting period. the Daily Treasury Statement showed that withholding for the first 12 days of January 2012 was $109.1 B vs. $98.0 B a year ago. Adjusting +0.54% due to the 2011 tax compromise, for the last 20 reporting days, $172.0 B was collected vs. $158.1 B a year ago, a gain of +8.8%. The Mortgage Bankers' Association reported that seasonally adjusted purchase mortgage applications increased 2.2% YoY and was also up 10.3% from one week ago. The overall trend remains flat since June 2010. Refinancing rose 27.9% in the last week as mortgage rates continued to hit new lows. For the seventh week in a row, YoY weekly median asking house prices from 54 metropolitan areas at Housing Tracker were positive, up +2.5% YoY. This is the best reading in close to 5 years. A majority of metro areas -- 31 -- had YoY price increases. Only 7 areas still had YoY% price declines of -5.0% or worse. Chicago remained the only area with a 10% YoY price decrease. Retail same store sales continued to perform well. The ICSC reported that same store sales for the week ending January 14 increased 3.0% YoY, but were flat week over week. 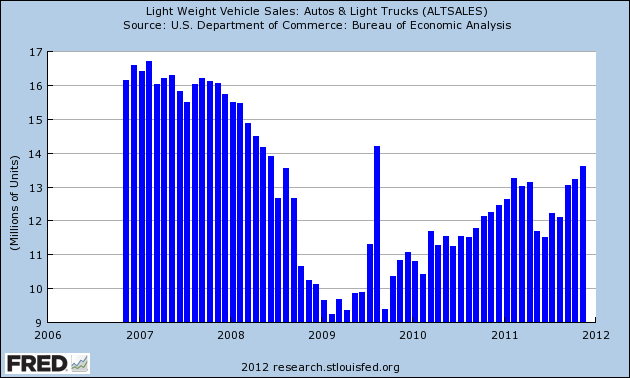 Shoppertrak, did not report, however, Johnson Redbook reported a weak 2.8% YoY gain, the weakest in 6 months. The American Association of Railroads reported that for the week ending January 14, 2012, with U.S. railroads originating 298,560 carloads, up 5.5 percent compared with the same week last year. Intermodal volume for the week totaled 229,091 trailers and containers, up 7.4 percent compared with the same week last year. M1 increased +1.2% last week, and +1.6% month over month. It is also up 19.4% YoY, so Real M1 is up 16.4%. This is near its peak YoY gain at the end of last summer. M2 was up +0.2% week over week, and up +1.4% month over month, and up 10.4% YoY, so Real M2 was up 7.4%. This is about 3% less than its YoY reading at the crest of the tsunami. Weekly BAA commercial bond rates declined .07% to 5.21%. Yields on 10 year treasury bonds fell .04% 1.95%. Falling spreads on lower rates is the best signal, although it is only for one week. This spread had a 52 week maximum difference in October and has been generally flat for the last month. Oil closed at $98.33 a barrel on Thursday. 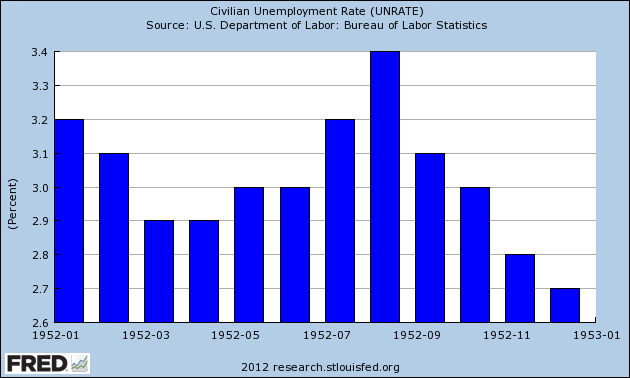 This is about at the recession-trigger level calculated by analyst Steve Kopits (adjusted for general inflation). Gas at the pump rose $.01 a gallon to $3.39. Measured this way, we are just at or slightly above the 2008 recession trigger level. Gasoline usage, at 7996 M gallons vs. 8775 M a year ago, was off -8.9%! The 4 week moving average is off -6.9%. Since March the YoY comparisons have been almost uniformly negative, and substantially so since July. It's at least possible some of this reflects the unusually warm winter most of the country has been experiencing. The TED spread is at 0.520 down from 0.542 week over week. This index is slightly above its 2010 peak, but has declined from its 3 year peak of 3 weeks ago. The one month LIBOR is at 0.277, down from one week ago and below its 12 month peak of two weeks ago, and also remains below its 2010 peak. The Baltic Dry Index at 893 has plummeted in the last 3 weeks and further continues to decline from its October 52 week high of 2173. The Harpex Shipping Index was declining for a full year, but at 396 is above its 52 week low of 389 two weeks ago. 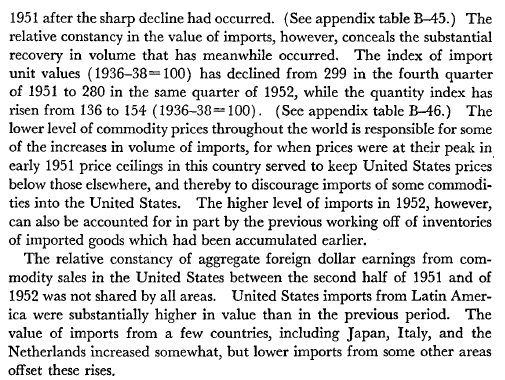 Please note that these two indexes are influenced by supply as well as demand, and have generally been in a secular decline due to oversupply of ships for over half a decade. The Harpex index concentrates on container ships, and has been leading at recent tops and lagging at troughs. The BDI concentrates on bulk shipments such as coal and grain, and has been more lagging at the top but has turned up first at the 2009 trough. Finally, the unweighted Shadow Weekly Leading Index was positive this week. 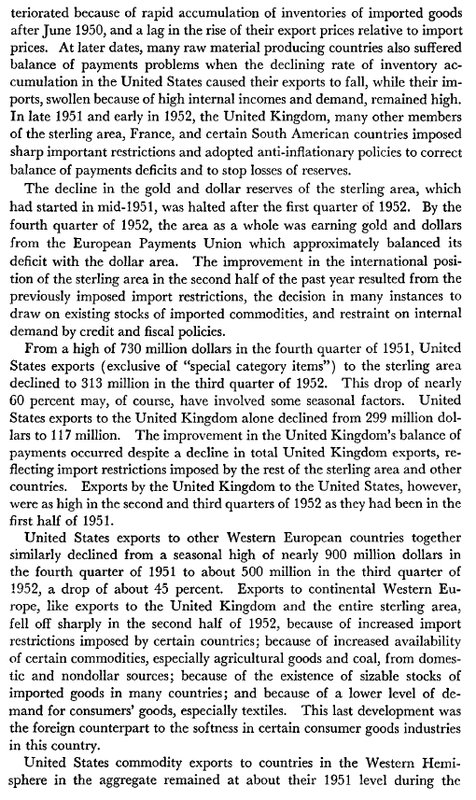 Next day, so was the ECRI WLI. Why was I not surprised? For the last two weeks, global worries have been abating. In the US virtually all the news is positive, but some weakly so. 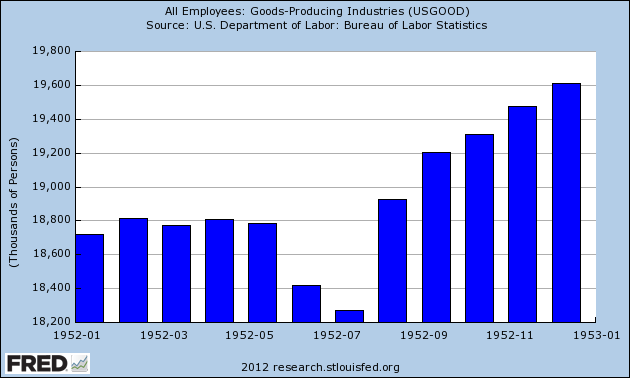 Still, there is no sign of any present or imminent downturn in the economy right now. P.S. This is a slightly truncated version due to ongoing time constraints. I will update with money supply, withholding taxes, and railroad information later if time permits. UPDATE 1/22: the missing info has now been added. 1. We still need to take the great initial jobless claims report with a grain of salt. 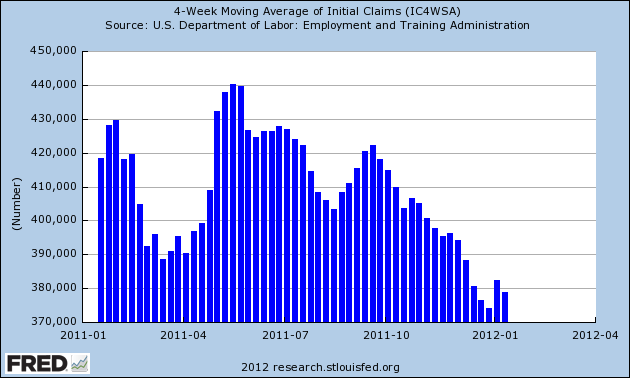 Unadjusted claims were 521,600 vs. 549,600 a year ago, so seasonality is still with us and will be for one more week. 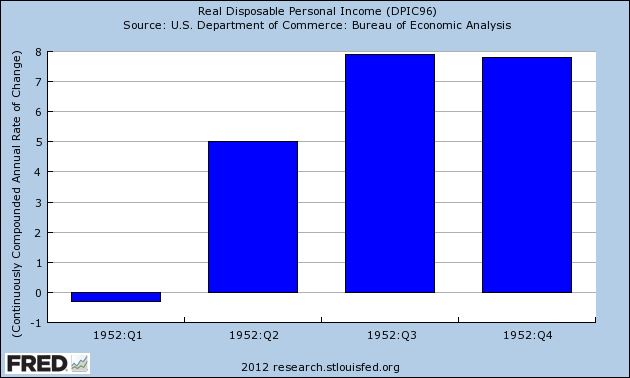 Nevertheless, it is harder to make the "imminent recession" argument in the face of such a decline. 2. In addition to initial claims, long leading indicator housing permits continued at 3 year highs for the second month in a row. Another long indicator, corporate Bonds, whether AAA, BAA, or the DJ Corporate Bond index, are within a whisker of all time highs. Money supply is still ample. A short indicator, the stock market, is within 2% of its six month high. 3. On the negative side, the 3 month average of CPI has tipped into deflation. In the past this has meant coincident weakness. Although YoY inflation is down to 3%, that's still higher than YoY wage growth, so real wages are still in decline. 4. While real retail sales for December turned out to be barely positive, both that metric and industrial production are a very small revision away from being negative. These are two of the 4 normally accepted metrics used by the NBER to determine if the economy is in recession or not. In short, the data is consistent with very poor growth in the last few months, but suggests an improvement in the economy at least after this quarter. 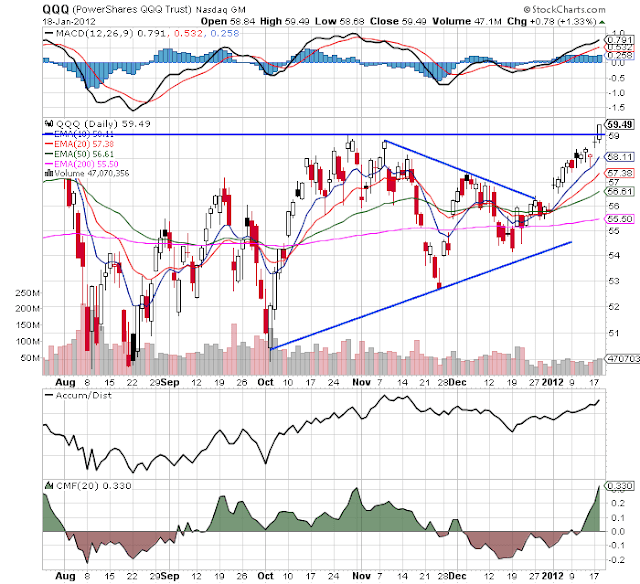 Is the Economy Getting Ready to Shift Into Overdrive? Weekly initial unemployment claims have been decreasing for the last three months. Yesterday, they printed a drop of 50,000. While the series is by definition volatile, the trend is very encouraging. The 4-week moving average is also moving lower. Both of the above numbers are now below 400,000, which is a very important point. While there has been much talk and understandable concern about the job market, notice that the economy has created 1,572,000 in the last 12 months. Granted, that is far from enough, but it's not as though nothing has been happening. 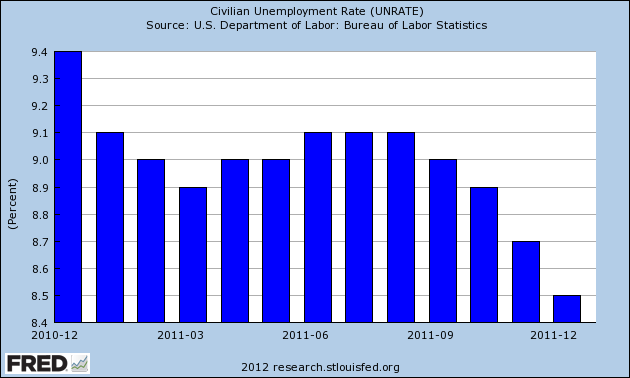 The unemployment rate has dropped nearly a point over the last year. 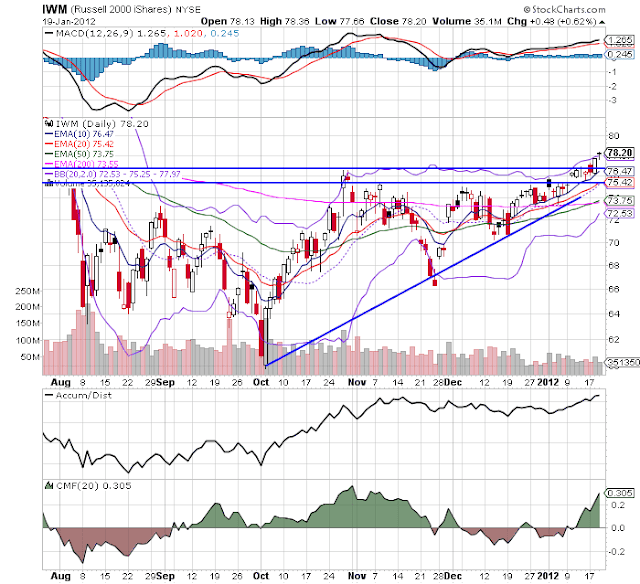 The homebuilding sector of the stock market is in the middle of a very strong rally. The daily chart (the upper chart) shows prices are at a 6 month high. 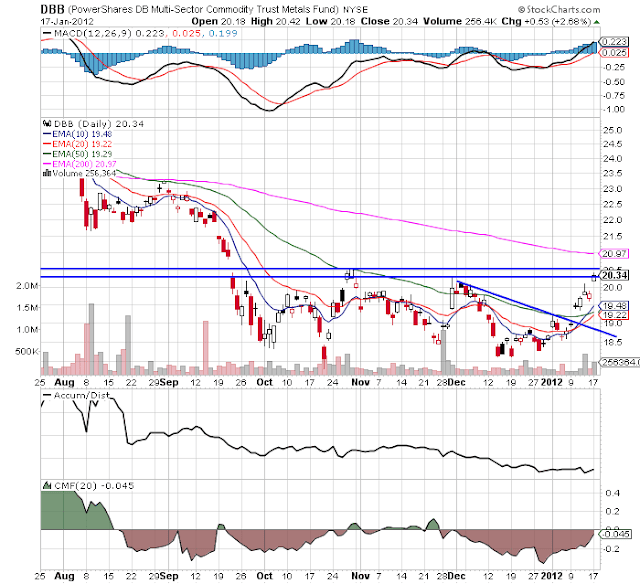 Morover, the underlying technicals are solid. The EMAs are bullishly aligned, the MACD is rising and we're seeing money flow into the market. 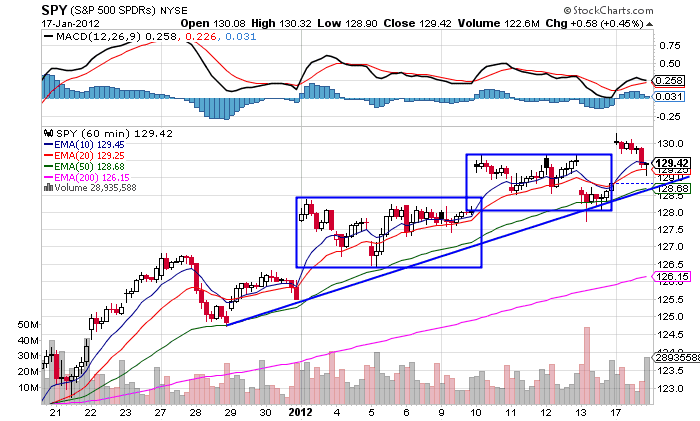 Also note the volume surge over the last few weeks, as evidenced by the sharp increase in the A/D line. The lower chart (a weekly chart) shows a very strong rally since last October, rising momentum and increasing volume inflow. notice the very strong weekly bars over the last few weeks as well. In other words, it looks as through traders are moving money into the homebuilding sector. A move above 19.5 would be technically important. The point of the above two charts is this: is the homebuilding ETF acting as a leading indicator of the housing market? That's up from the old record of 10.6 years in 2010, and it and continues a trend that dates to 1995, when the average age of a car was 8.4 years, according to a study of state vehicle registration data by the Southfield, Mich.-based Polk automotive research firm. That's a lot of pent-up demand for a durable good. 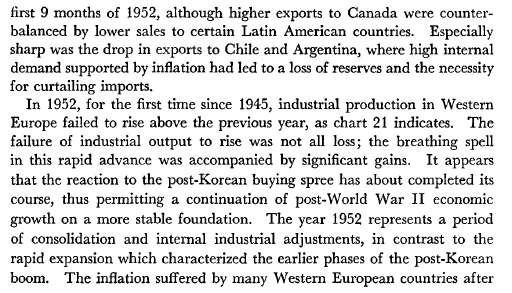 A big increase in auto sales was a big reason for the strong economy of the early 1950s, and may help to provide some of the ripple effect associated with an increase in new home sales that the economy is missing. 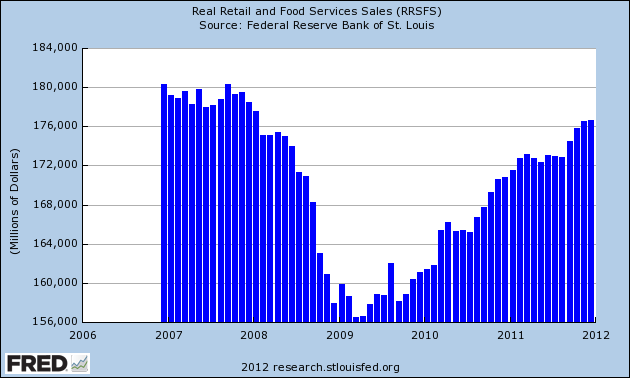 Overall real retail sales are still increasing and in an upward trajectory. However, December's results were disappointing, especially considering all the advance hoopla. 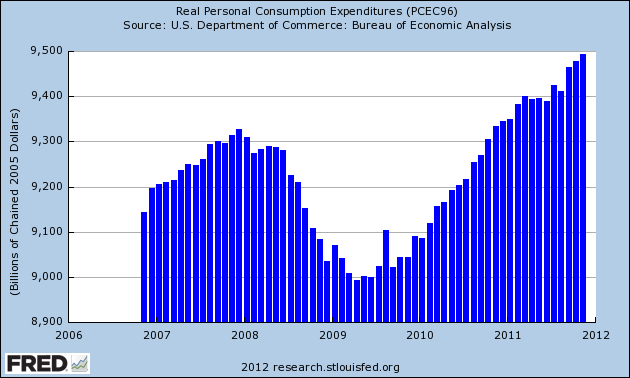 However, a broader and more complete picture of consumer spending -- real PCEs -- is clearly above its previous peak and is moving higher. Copper is rallying strongly on the weekly chart. 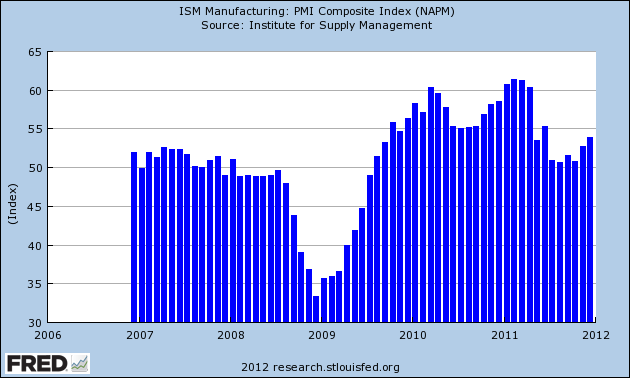 This tells us industrial demand -- especially from China -- is increasing. Spain and France, both hit by ratings downgrades last week, paid predominantly lower borrowing costs Thursday than at their previous auctions as markets remained upbeat after news of a possible boost in resources for the International Monetary Fund and hopes that Greece is moving closer to a deal with its bondholders. Spain sold €6.61 billion (€8.5 billion), more than the €3.5 billion to €4.5 billion planned. With its January bond auctions, Spain has completed almost 20% of its 2012 targeted gross issuance of €86 billion. This is but one auction -- and one of the first big ones after the ECB opened up an increased lending facility. However, it is a good sign. 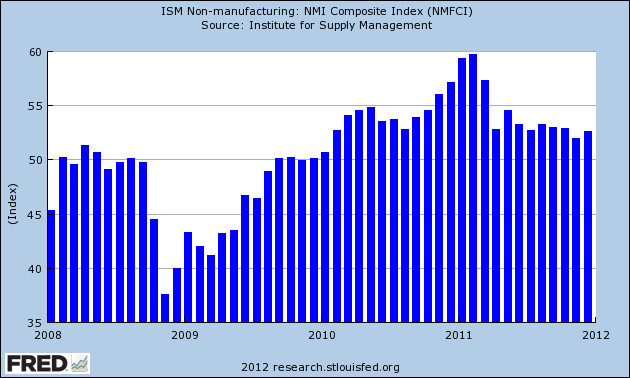 After falling at the end of last summer, the ISM manufacturing index has rebounded. Also note this number never went negative, instead resting just above the 50 line. The ISM service index has been hanging just in positive territory as well. Yesterday's initial claims print was the real driving force of this thought process. That number has been fluctuating around 400,000 for the better part of the last year. Yesterday's drop was exceedingly sharp and pronounced, and moved the number well into a "we're going to have a stronger recovery" territory. My guess is employers have gotten to the point where they simply have to increase their labor force and so have said, "it's time. Let's move forward." Now, it's also important to remember that it's only one print and could reverse next week. But then it's important to note the overall direction, which is clearly lower. 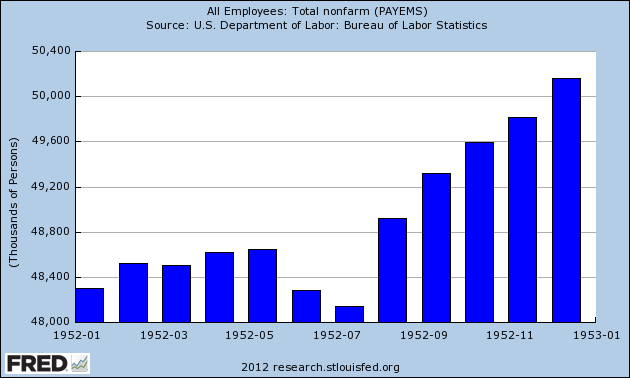 That makes me think a rebound will be a temporary hike as opposed to the beginning of a long-term, upward trend. Couple that data with the recent employment figures -- which have been pretty good -- and it appears that the employment situation is finally set to really improve. 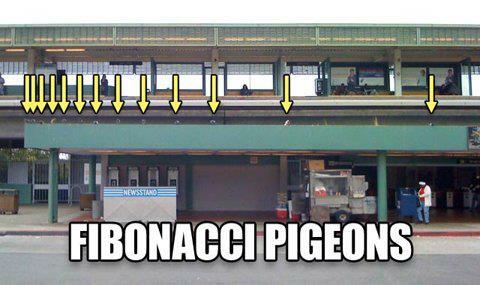 This solves one of the biggest problems with the economy. 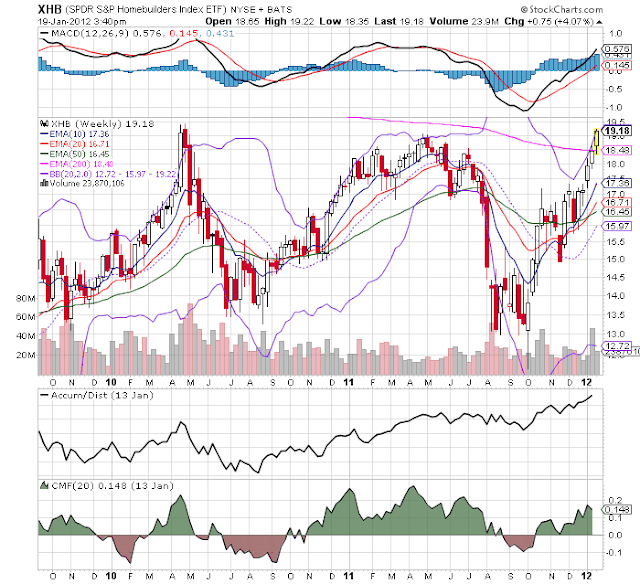 That led me to look at the homebuilding sector of the stock market, which I hadn't really seen in a while. 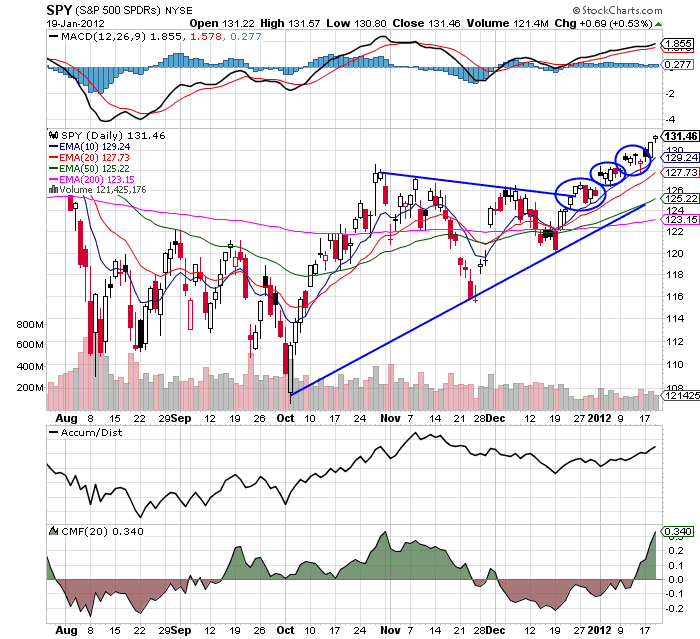 The charts were very bullish, which made me think traders were more and more comfortable making long-term bets on the market. Assuming the employment market continues to improve, that should have a ripple effect into the housing market, where record low interest rates and lower prices should bring in buyers. The continued strength in car sales tells me that consumers are comfortable making long-term purchases, so a new home is a simple stretch from that position. Assuming the preceding thought process is accurate, we see that the economy is on the way to solving its two big problems: employment and housing. 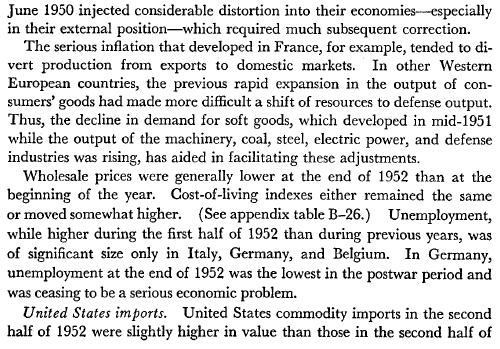 Also note the general backdrop provided by the rest of the economy is still fairly sound. The manufacturing and service sectors -- as represented by the respective ISM indexes - are still in positive (read expanding) territory. 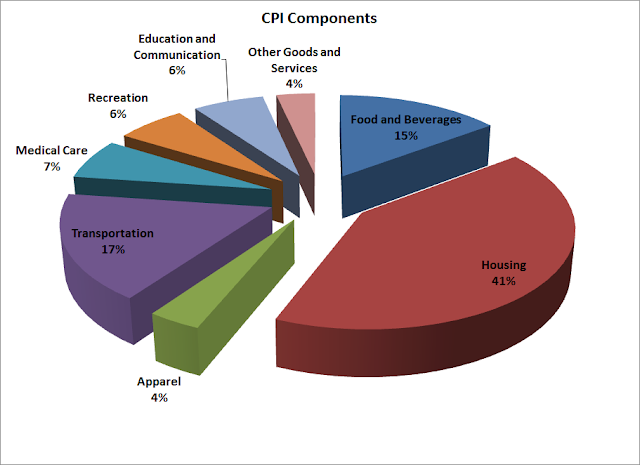 This tells us that both business sectors are at minimum holding their own. And while the EU situation is still the big wild card in the room, the recent move by the ECB to greatly increase liquidity is so far having its desired effect -- to calm markets. While we're still not out of the woods in the EU (in fact, if anything will derail the previous thesis it's the collapse of the EU in some manner), the region has limped along for the last year. If we do see a recession (or if we're already in one, which is highly likely) I think it will be shallow and only last for 2-4 quarters. 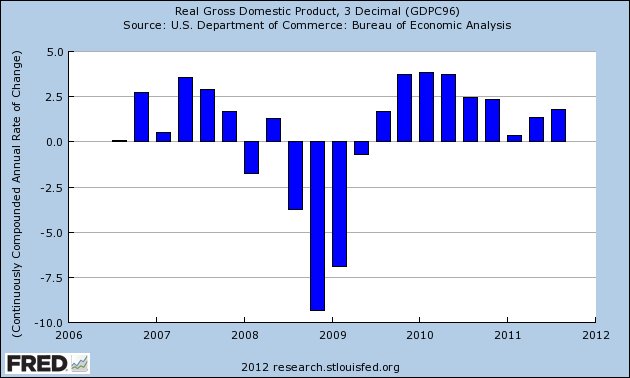 The US economy has been growing for the last nine quarters. Granted, the growth has been weak, but it has been moving forward. 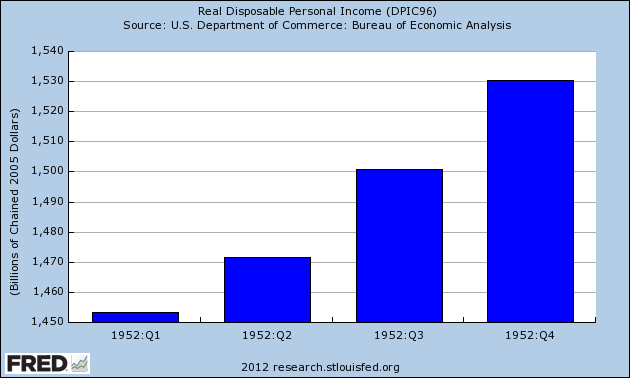 This tells us that there is already a foundation for growth. In short, the piece are aligning. I will add that execution is an entirely different matter. But, put me in the, "I think the possibilities are getting far more bullish" camp for the moment. I'm not the only person who has been concerned with the inter-market market situation. 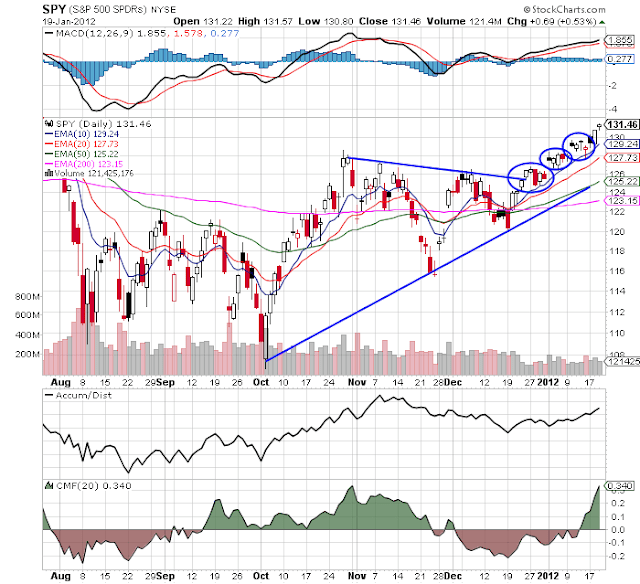 Corey over at Afraid to Trade has noted that the stock, oil and treasury markets are rallying, which is a situation that can't hold forever. 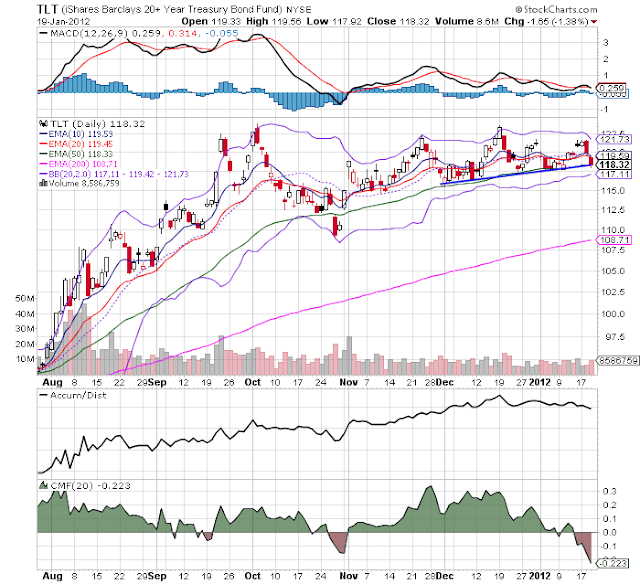 Both the IEFs and TLTs are right at short-term support. 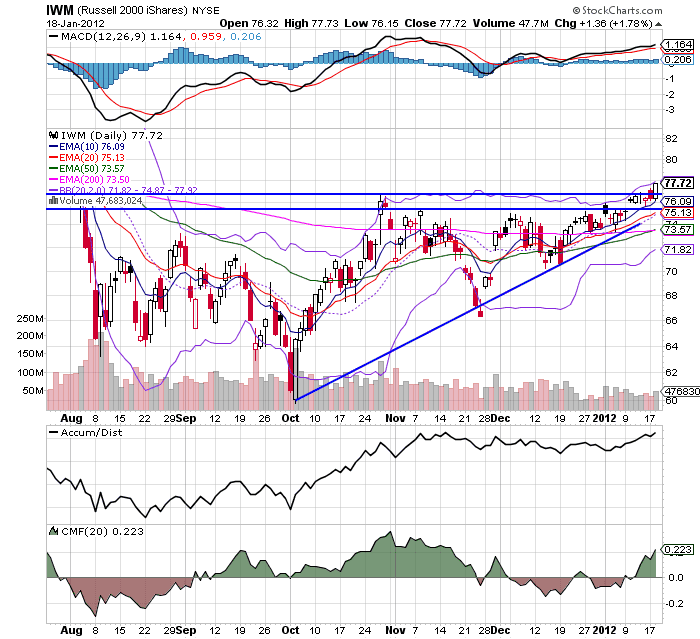 The technicals for both are weakening. 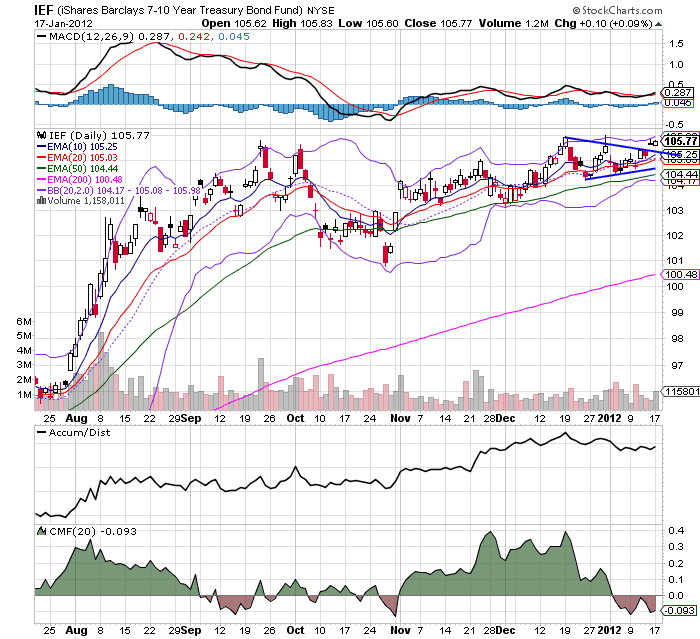 The respective CMF's are negative and the MACD was very weak for the rally. In fact, note the MACD for both for the last six months; it peaked over 5 months ago and has been moving more or less sideways since. The 60 minute QQQ chart is great. It's in a clear uptrend. Over the last three days we've seen a gap higher, rally and further gap higher today. The daily chart of the QQQs shows an increasing volume inflow (rising A/D and CMF) and increasing MACD. 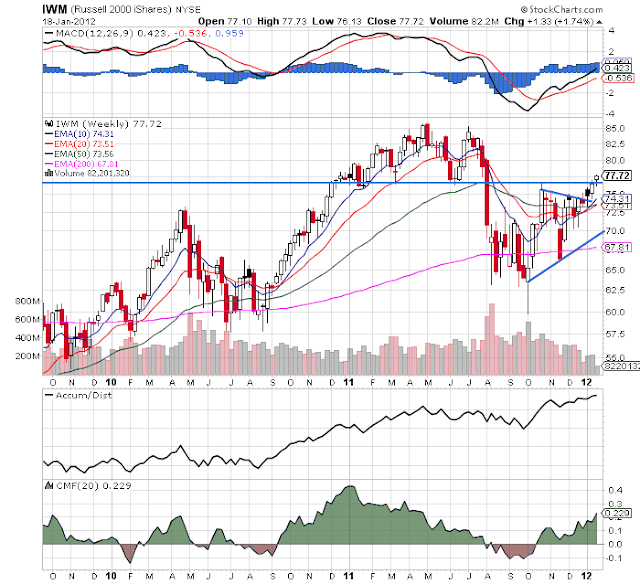 Prices are not through six month resistance levels. On the weekly chart, we see prices break through resistance, printing a strong candle. 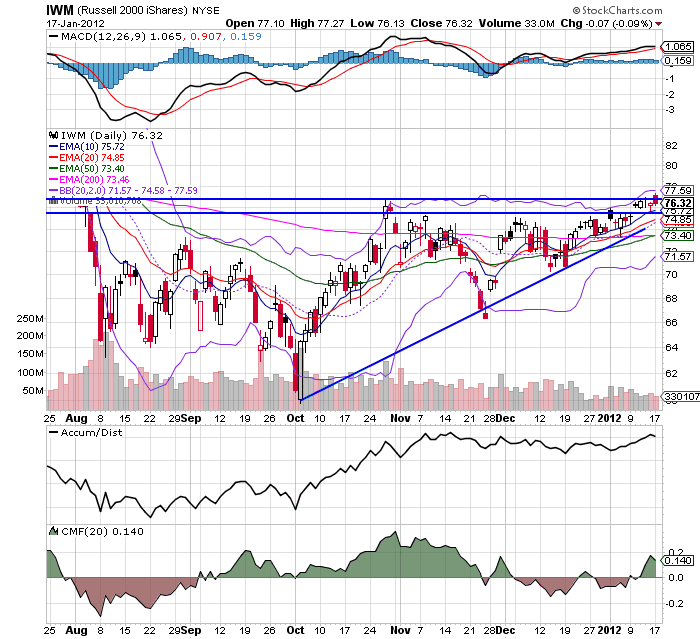 The IWMs have moved through resistance. 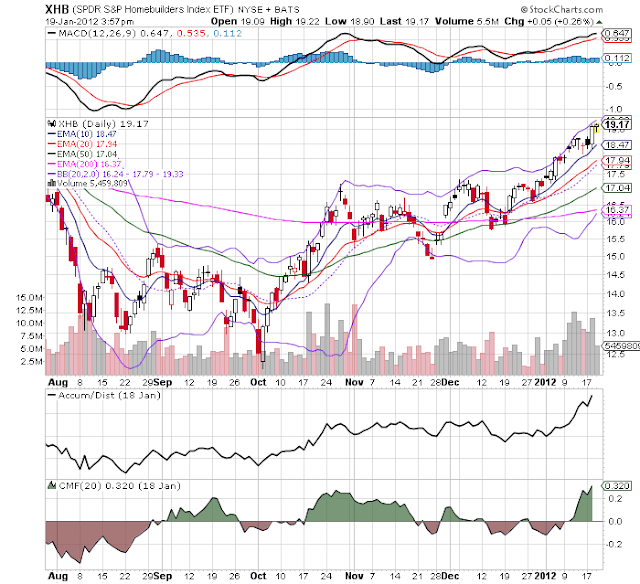 They printed a strong bar day before yesterday, but printed spinning top outside of the upper Bollinger Band, which is usually a sign of an upcoming reversal. 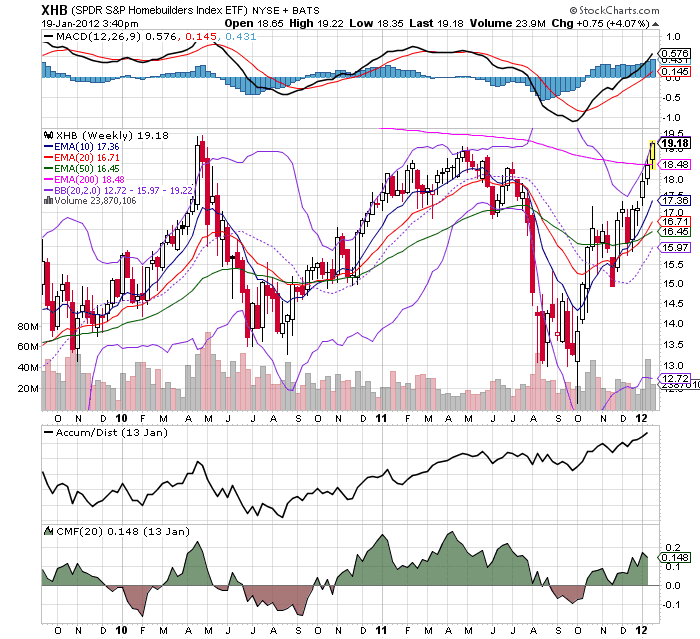 However, we're seeing a rising CMF, A/D and MACD. 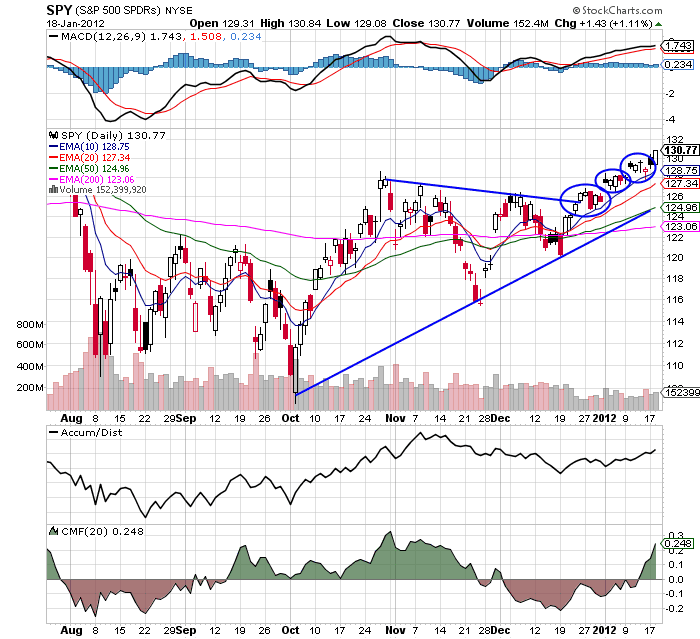 The SPYs are still in an uptrend, with a strongly positive CMF and rising A/D. 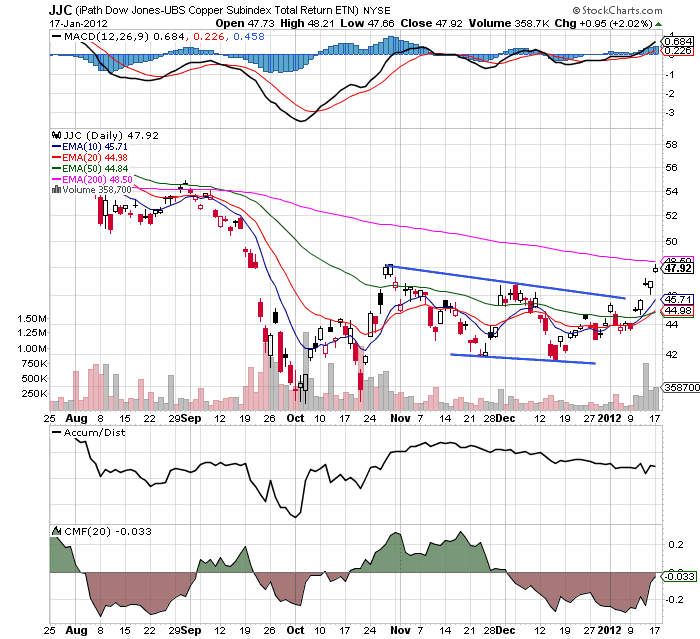 Also note theh rising MACD. 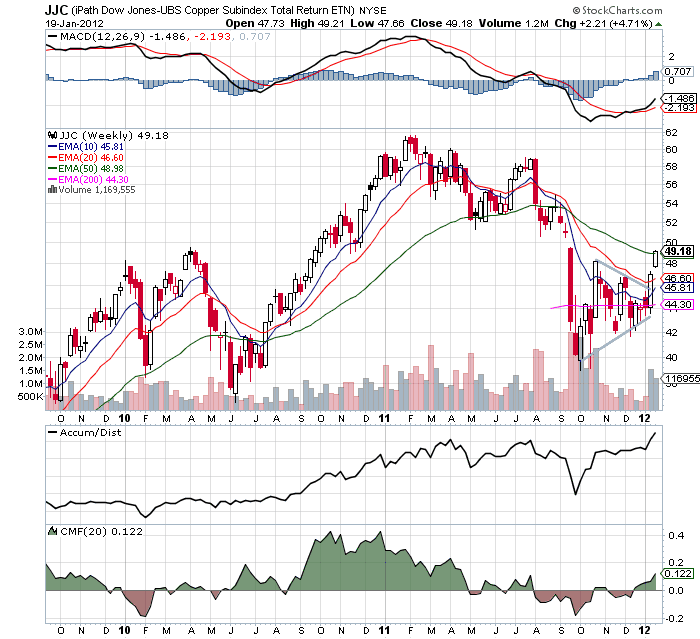 The weekly copper chart is very bullish. 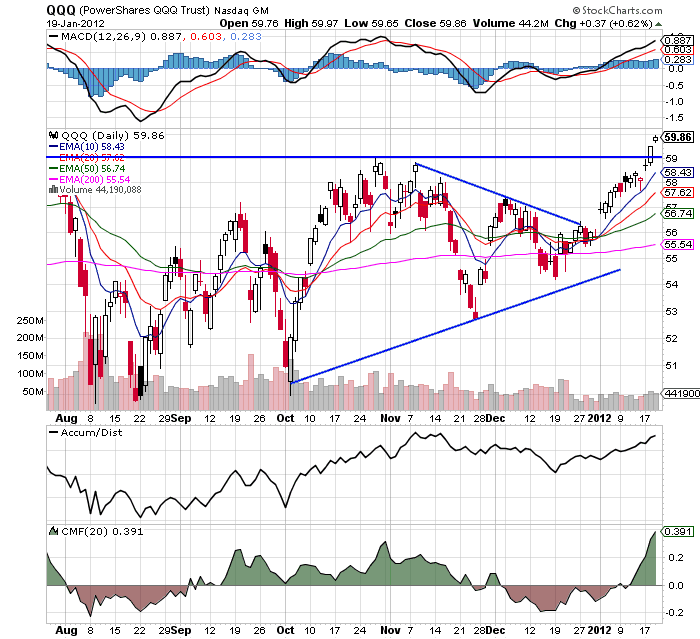 We've seen strong moves over the last two weeks on very strong volume. Money is flowing in and momentum has reversed. This is a great chart. I wanted to take the time out to make the following points about the blog. 2.) I would be remiss if I didn't point out that I went bullish on the market on Monday when it broke out (of course, having said that, expect a crash in the next few days). 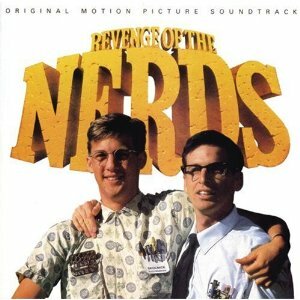 So, from both NDD and myself, thanks for reading and having a data-centric view of reality. The predicted week over week change is therefore predicted to be positive. We'll have an answer tomorrow. The unemployment rate -- which was already low -- continued at it's strong rate, fluctuating between 3.4% and 2.7% for the year. Total employees on all payrolls was more or less constant for the first seven months of the year, but really started to take-off in the last five months. 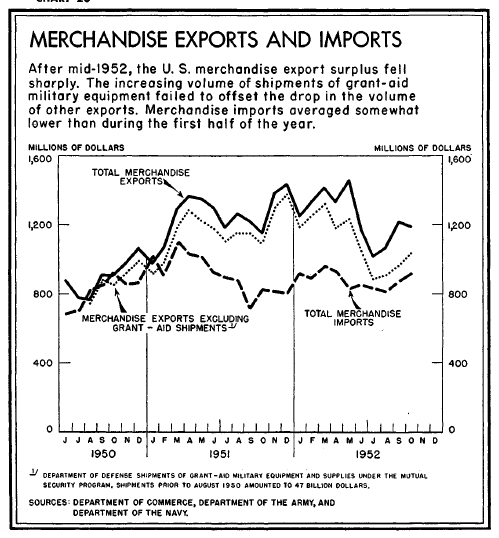 Goods producing industries were pretty constant for the the first five months of the year. They dropped over the summer, but then really took off. 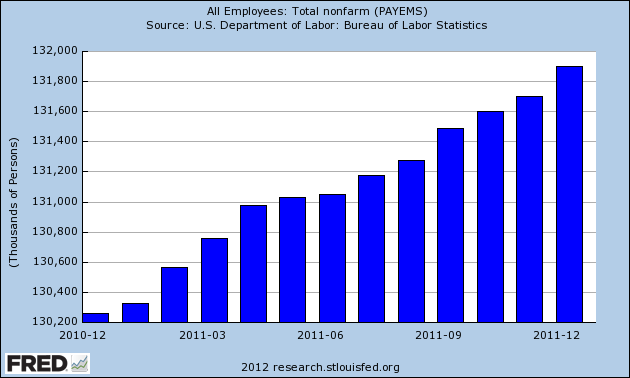 adding over 600,000 jobs in the last five months of the year. Service producing industries saw better overall performance; they increased a bit during the first few months, leveled off, and then increased strongly in the last five months of the year. 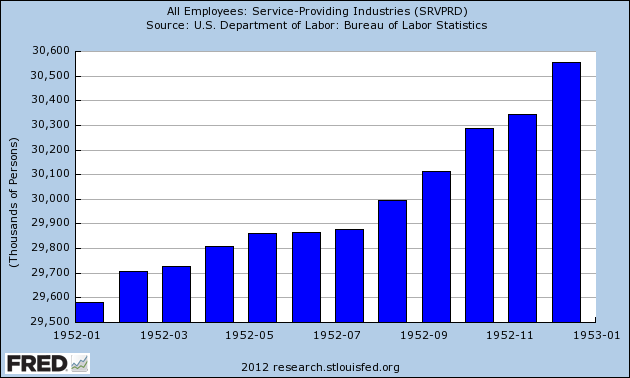 Overall, we see services adding a little under 1 million jobs for the year. 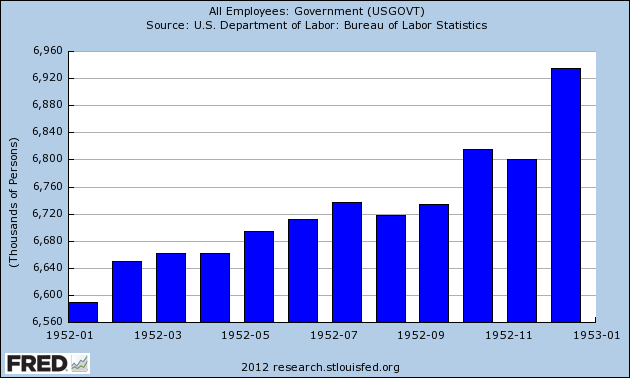 Growth in government employment mirrors the service industry chart for the year. 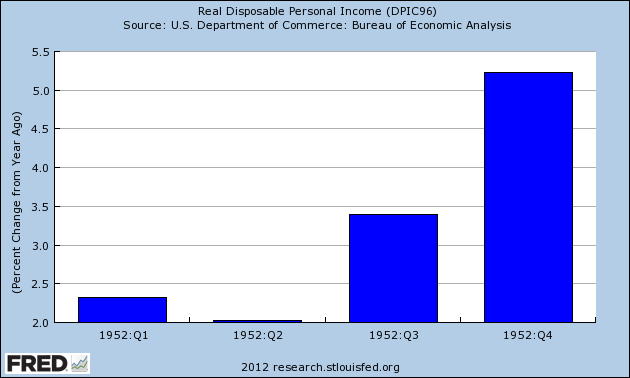 Total DPI increased every quarter in absolute (inflation-adjusted) terms. The continuously compounded annual rate of change was weak in the first quarter, but picked-up momentum in the second and third quarter, and ended the year on a strong note. The rate of change year over year was small in the first half of the year, but accelerated in the second. 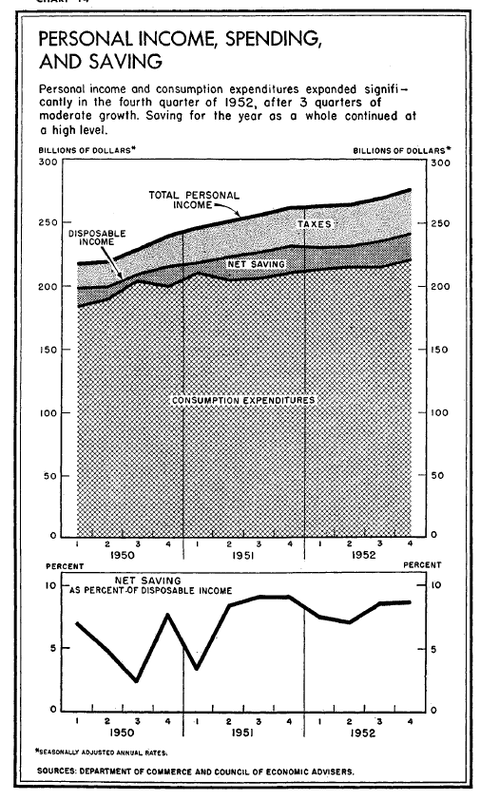 Finally, above is a chart from the 1953 Economic Report to the President that shows income and savings -- which was at a very strong rate in 1952. 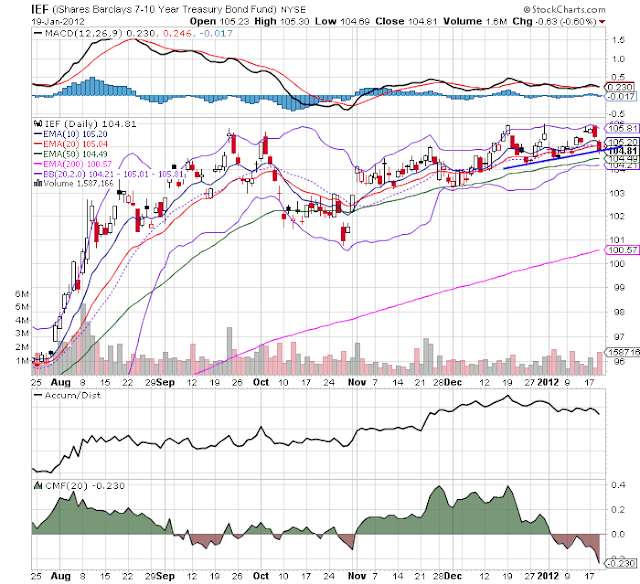 Take a look at the three ETF charts below: I'm much happier. 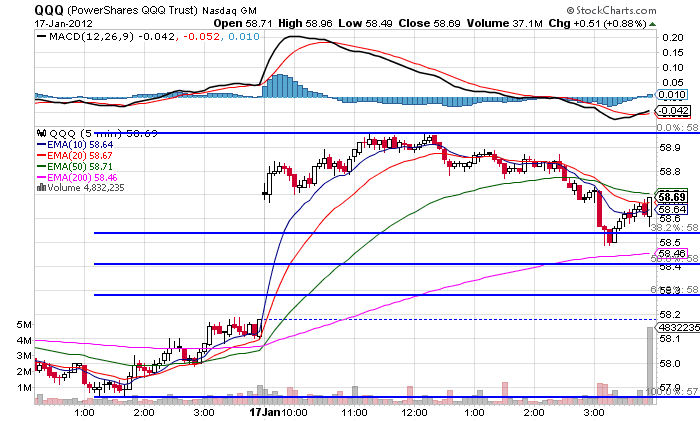 Both the IWMs and the QQQs broke through important resistance levels yesterday, printing fairly decent bars. I'd like to see more volume, but nothings perfect. In addition, we see some strength in the SPYs. 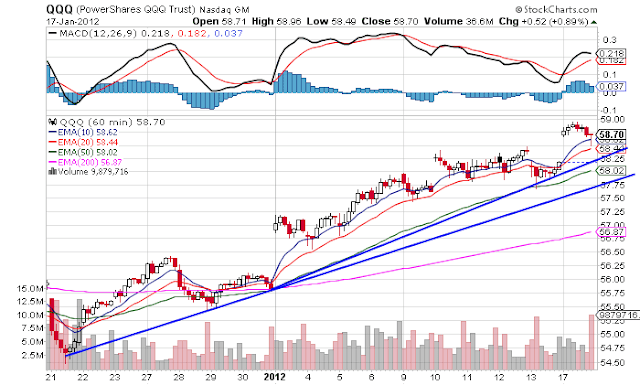 On the QQQs and the SPYs we see the EMAs fanning out into a stronger, more bullish formation. We also see the CMFs increasing. 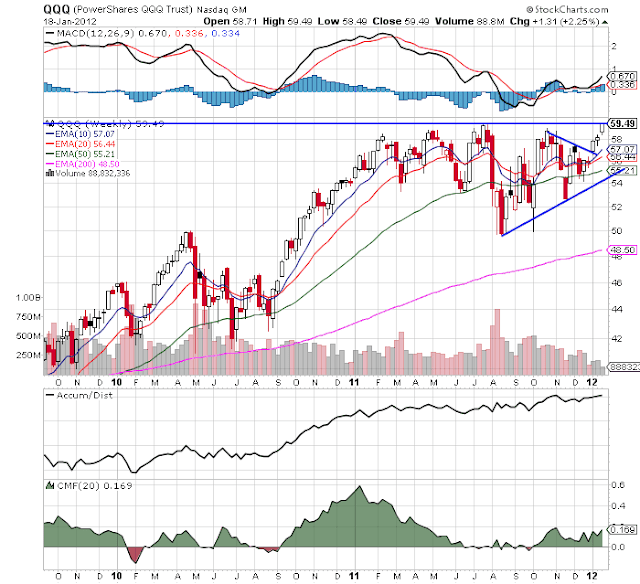 In short, the equity charts are looking much better now. 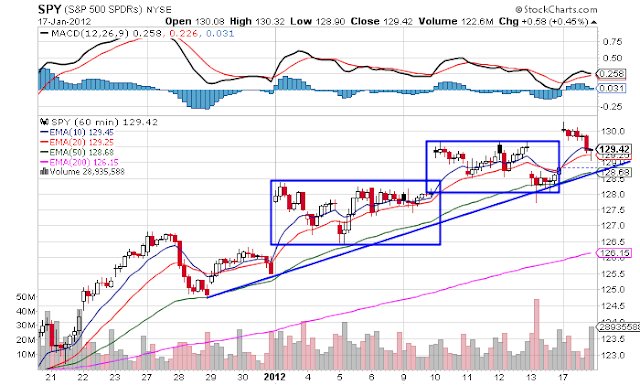 In addition, we're seeing an advance where all three averages are making moves. That's a very good sign. 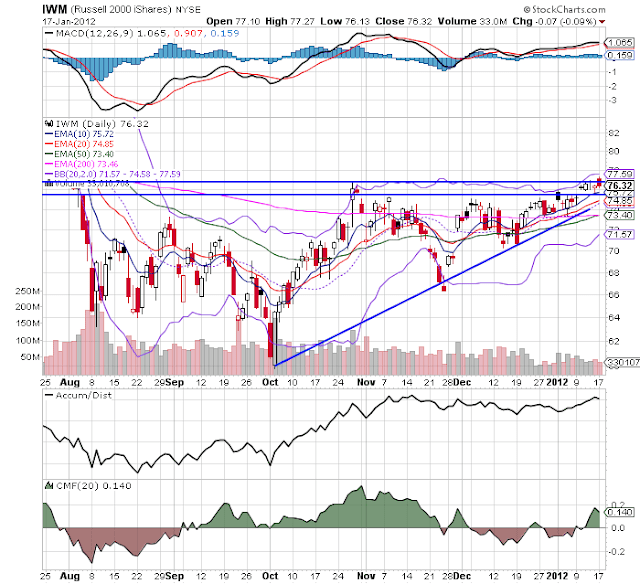 The IWMs have broken through short-term resistance. Also note the increasing CMF and A/D line above, indicating more participation in the riskier equity index. While I missed the first part of the rally due to caution, I still believe my concern was warranted. Also note the importance of looking at multiple markets in order to make a decision. The above charts shows that in 1952 neet exports were a drag on overall growth. 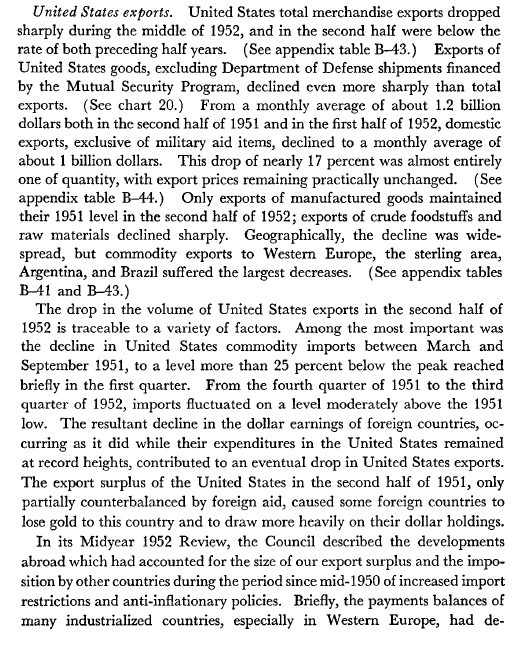 We see one quarter -- the first -- where overall exports increased and added to GDP. 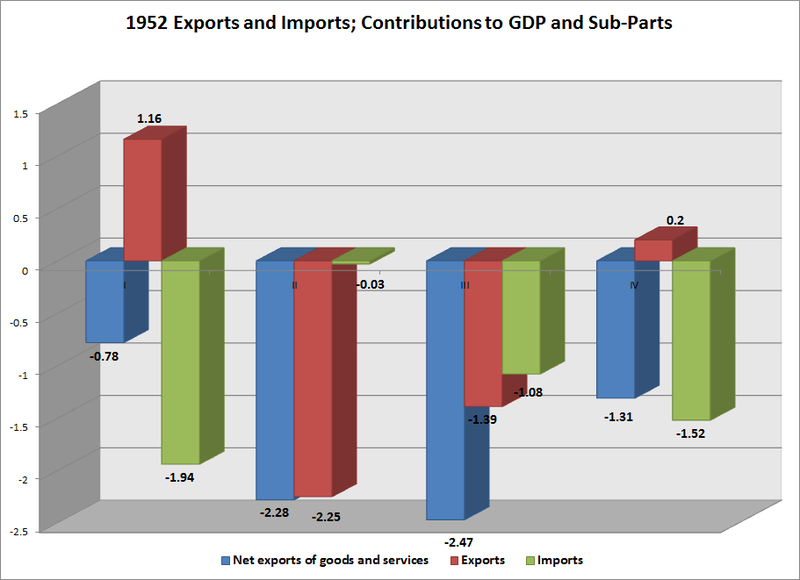 But in that quarter we all see a large contraction in imports, meaning overall net exports subtracted from growth. The second and third quarter show marked contractions as well. 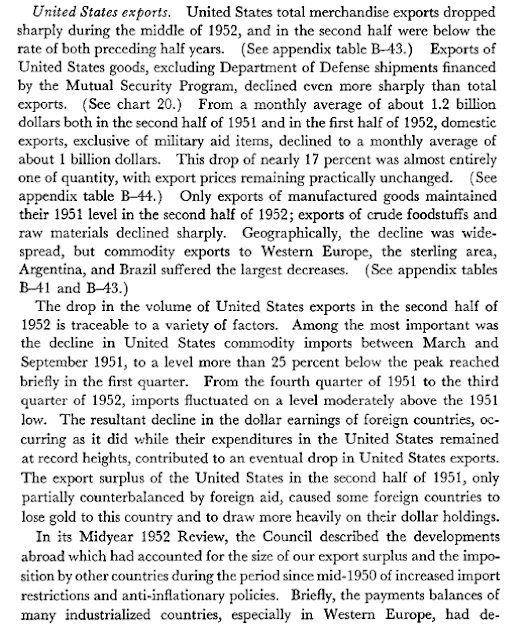 The fourth quarter we see a positive contribution from overall exports, but, again, imports sharply contracted, leading to an overall contraction for the quarter and a terrible year for exports. On the day I turn bullish, the market pops higher -- it happens so rarely, that you've got to take credit for the call. That being said, the above 5 minute charts show that the price action was weak -- upside gapping in the AM with a downward drift throughout the day. This is the type of price action that led me to be very cautious about the market as a whole. A lack of follow-through is very concerning. 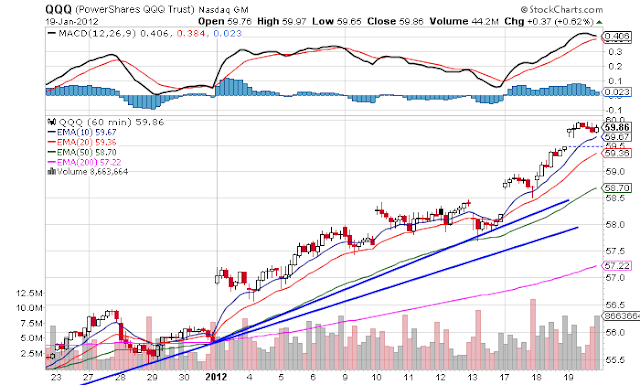 However, the 60 minute chart is still bullish for both the QQQ, and SPY. The fact the IWMs are still hemmed-in by their late October highs is a problem as well. 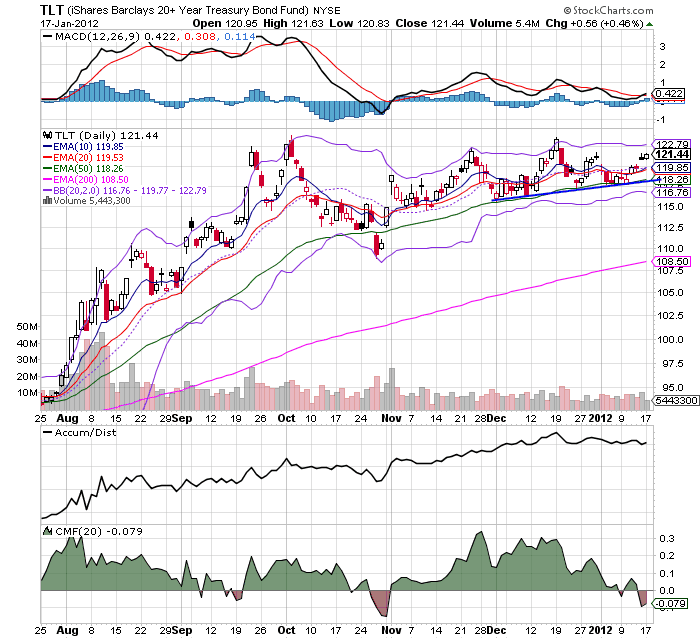 However, the IEF and TLTs are still above long-term trends. The good news for stock bulls is the A/D and CMF are weakening for both, but we still need to see momentum move lower. On the good side, industrial metals generally and copper specifically are posting strong gains. Industrial metals are right at technical resistance and copper is right below the 200 day EMA. 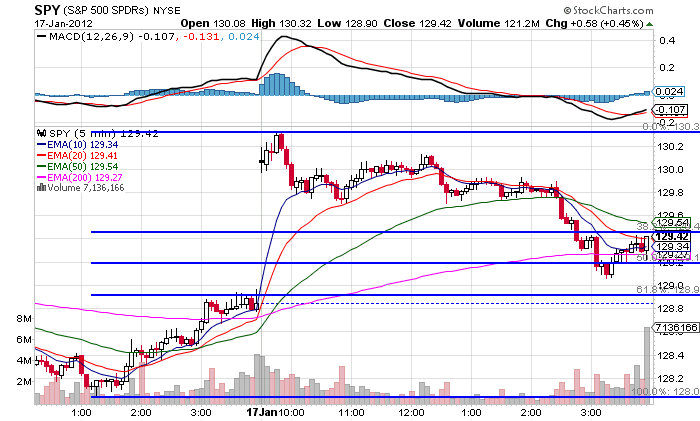 On both chart, we're seeing the shorter EMAs (10, 20 and 50) move higher. We're also seeing a nice volume surge -- especially in copper.